Paynesville Area Middle School students had the opportunity to explore new areas last week as they held their first “Winter” Exploratory Day. The rock climbers headed to Vertical Endeavers in St. Paul. The students found the walls were challenging, yet fun, and they are ready to try it again. Tom Smith said “Rock climbing was fun. It was hard on your arms. I would go again.” Nick Binsfeld added it took lots of effort for some of the walls. He thought it was challenging. Due to the lack of snow on various area trails, the snowshoeing turned into a snow adventure where the students roasted hot dogs over an open fire on First Island, then played golf on Lake Koronis. At Powder Ridge, the students were able to receive lessons on how to ski and snowboard. 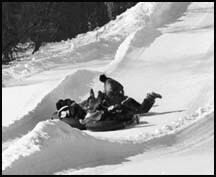 On the tubing slope, the students had a choice of three different slopes to slide down.